PT Tri-Die Pressurized Dust Insecticide aerosol combines the repellency of pyrethrin and the long term stability and repellency of silica dust. 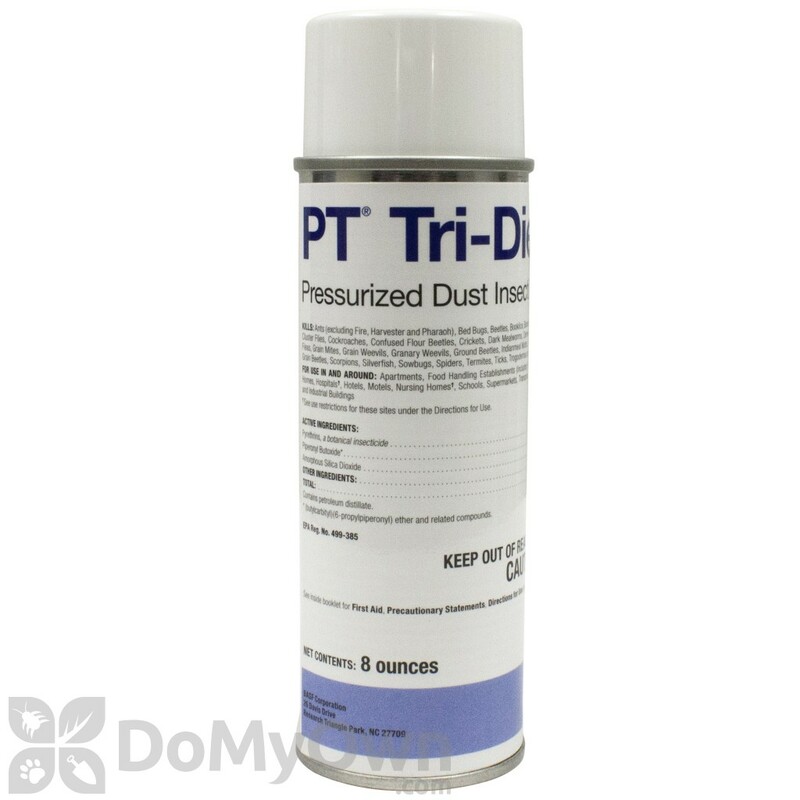 PT Tri-Die leaves a dust residual behind after spraying that kills a wide variety of insect pests. PT Tri-Die is great for wall void applications and crack and crevice treatments. Prescription Treatment Tri- Die pressurized dust offers a convenient, easy application with no additional equipment necessary. Pressurized, charged particles penetrate deep into cracks, crevices, wall and ceiling voids to provide an ideal uniform dust application, readily adhering to all surfaces. The unique 4-way red application straw can be used for void space application to deliver 360-degree coverage. PT Tri-Die offers three way insect control - contact, repellency, and residual effect. When an insect crosses through an application area the dust is attracted to the insect's oily or waxy outer cuticle and the insect loses body moisture and dies. The naturally derived active ingredient in PT Tri-Die creates an unsuitable environment for insect pests. PT Tri-Die is available in a convenient 8 ounce can making it easier to use in confined spaces and easier to store. Inject dust into wall void areas around windows and door frames, openings around pipes and sinks, behind baseboards and beneath carpet, in cracks and crevices of cabinets and pantries, sewer and floor drains. In food areas: Apply to cracks & crevices and void areas between different elements of construction, between equipment and floors, openings leading to voids and hollow spaces in walls, equipment legs and bases. Apply dust behind siding, into wall voids, around window and door frames, into cracks of foundations and other places pest may be entering the building. For Carpenter Bees, apply directly into entrance holes. I worked with a reputable pest control company for 8 years and I have found Tri-Die to be a great repellent. I used this product for many insects. The beauty of this product is it is a long lasting residual and will keep most pests that come in from outside through cracks and crevices out of your home. It does leave a powder film where it is applied, so make sure you use only in wall voids and cracks as the label states. My target pest presently is ants. If you have carpenter bees, this stuff will take them out. Using the included tube, I sprayed this stuff in the hole and moved to the next hole. By the time I got to the third hole bees were falling out the previous two and dying. Wait a few days, then plug the hole with wood putty or cork. Done. The can says it works on other pests, too. I have to believe them, given it's effectiveness. I ALWAYS wear protective gear -- gloves, safety glasses and some kind of mask. In all the holes I could get to this seemed to work great to get rid of my carpenter bees. It leaves a white residue so be careful on trying to just spray where you need it to unless you want to have a big clean up issue afterwards. Tri-die has rescued me on numerous occasions- particularly from ants. This weekend I've discovered it's a sure fire way to battle Springtails coming in around a window and french door. The Springtails have been freaking me out because two other professional insecticides that I normally use to handle just about every desert-dwelling insect that attacks my home had failed. This morning I remembered the can of Tri-Die and put it to work. Problem solved. Unfortunately my local Bug and Weed Mart has stopped carrying it. I'm happy to learn that I can order it online! Although Tri-Die was offered as a solution for carpenter bees, there was nothing about them on the container itself. I tried it anyway. Injected a one second or so shot into the hole and cleared away the collected sawdust. More appeared the next day indicating that the bee(s) were still alive and kicking. Tried again with maybe a 4 or 5 second shot. No new sawdust for 3 days. But it is back again. Will try one more longer shot. If that doesn't work, I'll have to conclude that Tri-Die doesn't work for carpenter bees. Had to give it a minimum of one star. However, no result merits no stars. Can you use Tri-Die for bedbugs? If I understand correctly, you can spray Tri Die on the fold and tufts on your mattress and box spring to instantly kill bedbugs. It has the residual effect of silica gel or DE for future killing. Is this correct? Tri-Die does contain pyrethrins which offers a fast knockdown of insects when they are sprayed directly, and also contains silica gel for residual control. According to the product label, "Take bed apart and treat cracks, joints and interior of framework. Mattresses and box springs should be treated especially tufts, folds, and edges. Picture frames, moldings and all cracks and crevices in the room should also be treated." I've have used Tri-Die, which works very well, but the darn thing jams. Tip: To prevent aerosol dust from clogging, make sure to turn the can upside down after each period of use and spray until just air leaves the canister. This will clear the nozzle and keep it from oozing, and prevent clogging. Why did more bees show up after I sprayed Tri Die? I have a little front porch with a roof that covers the entryway. I went outside to spray this in pretty much all the cracks (with the little clear tube that comes with it) and esp. sprayed where I have seen bees hovering around. I sprayed where the exterior wall meets the roof and mostly around the cracks nearest to the doorway. I went to mow the lawn after, and then came back to the front door when I was done and there were two big beefy wasps buzzing and hovering around the porch! And no there is a big carpenter bee too! I don't know if maybe I sprayed a nest? I really don't know how/why they could be attracted to it, but is that possible? I know it sounds silly but I have no idea what the heck is going on now lol. Any advice/thoughts? It sounds most likely that they are not attracted to the Tri Die. Instead you probably sprayed the areas they like to nest and now they cannnot enter so they are just hovering near the areas they used to go into. Can I use "Tri Die" to treat for Wood Carpenter Bees? I know Delta Dust is the thing to use then plug hole, but I had someone come and treat my porch and they used a wet spray that dried to a powder that was called "Tri-Die". I read the label on the can for what it kills and it never listed carpenter bees (or any bees for that matter).... Although they were dropping left and right... Is it safe to say that "Tri-Die" will also work in killing these carpenter bees? Tri-Die contains the active ingredients Pyrethrins and Silica Gel. This combination of active ingredients offers a pretty fast knockdown and residual control of lots of insects, even those the product is not labeled for. What area can a can of Tri-Die cover? How much coverage will one can of Tri-Die provide? For example, if you were to inject the product into holes along a floor into a wall (as I am doing), how much wall could one realistically do? 10 feet, 100 feet? breeding. Place injector tip into cracks, crevices, holes and other small openings. Release approximately one second of product. Move injector tip along cracks while treating at the rate of three linear feet per second. For closed voids calculate the void’s cubic area and treat at the rate of three to five seconds per three cubic feet. For closed void areas drill small access holes. Several holes may be required in long-running voids. This product can leave a white residue. This residue can normally be removed with a damp cloth or sponge. Based on the verbiage on the product label of only releasing the product for 1 second per hole, we would imagine you could probably do close to 100 feet of wall space. This is just an estimate.